Coral reef is the term for any fully marine, underwater ecosystem with a calcium carbonate foundation produced by the skeletons of living organisms, a substantial number of which are corals. Generally, coral reefs are considered to be those limestone formations and associated biotic communities in which the corals have a symbiotic relationship with algae and thus they are found in shallow and warm marine waters with significant sunlight penetration. However, there also are corals that do not have associated algae and these can produce reef formations in deep, dark, and cold marine environments. These deep-water reefs are called coral bioherms, which some consider as a type of coral reef, and others consider as distinct from the term coral reef. The calcium carbonate found in coral reefs not only comes from skeletal material built up by coral over time, but also from such living organisms as coralline algae and foraminiferans, among others. The calcareous structure produced by the living organisms makes for an excellent habitat for animal and plant life. Known as "rainforests of the sea" and "oases in the desert of the ocean," coral reefs are among the most rich and diverse ecosystems on Earth. Despite covering less than one tenth of one percent of the world's oceans, coral reefs provide a habitat for twenty-five percent of all marine species, resulting in complex food webs. Paradoxically, these biologically rich systems flourish even though they are surrounded by ocean waters that provide few nutrients. In addition to their vital ecological function, coral reefs provide important economic values for human beings, delivering ecosystem services to tourism, fisheries, and shoreline protection. The annual global economic value of coral reefs has been estimated at $US 375 billion. However, coral reefs are fragile ecosystems, and despite these values, various anthropogenic factors have resulted in the loss of substantial amounts of coral reefs in recent decades. There are estimates that 75% of the world's coral reefs are presently threatened as a result of human activities. In recent years, people have devoted a greater attention to protection of coral reefs, including efforts to effectively manage them in protected marine parks and reserves. The foundation for the underwater structures of coral reefs comes from the calcium carbonate secreted by corals and other living organisms. Corals are those marine invertebrates of the phylum Cnidaria and the class Anthozoa that have external or internal calcareous skeletons; the skeletons of these animals are also called coral. Corals exist as small polyps, typically in colonies of many individuals and commonly attached to a hard surface. The polyps secrete a hard carbonate exoskeleton which provides support and protection for the body of each polyp. New corals grown on the foundation of the skeletal material left by earlier reef-building corals, thus extending the coral reef, with the living reef community on the surface of the reef. Most coral reefs are built from stony corals. 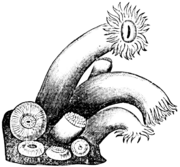 Other organisms that deposit calcium carbonate include various algae, foraminiferans, mollusks, annelids, and echinoderms. 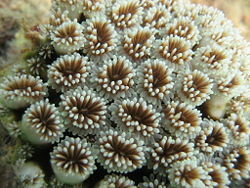 Close up of polyps arrayed on a coral, waving their tentacles. There can be thousands of polyps on a single coral branch. Corals are found in marine waters that contain few nutrients. Although corals can catch plankton, these animals obtain much of their nutrients from symbiotic unicellular dinoflagellates (type of photosynthetic algae) called zooxanthellae. Consequently, most corals are dependent upon ample sunlight and for that reason are usually found not far beneath the surface, restricted to the euphotic zone typically above about 70 meters from the surface. The reefs from these corals are found in tropical and subtropical marine waters, where the water temperature does not fall below 18°C (64°F) for extended amounts of time, and generally is above 22°C (72°F), although corals live outside this range. Coral reefs formed from such symbiotic corals are almost exclusively limited to the range of latitudes from 30°N to 30°S,. The most extensive development of extant coral reef is the Great Barrier Reef off the coast of Queensland, Australia. Indonesia is home to almost 600 of the world's approximately 800 known coral reef-building coral species. However, some corals, notably the genus Lophelia, do not have associated algae, and can live in much deeper and colder water. These form reefs as well, although these are typically called "coral bioherms." Some authorities consider the term coral reefs to include these deep-water coral bioherms, based on their biological and physical characteristics.. However, other authorities distinguish these terms. Cold-water corals can be found in such locales as off the coast of Norway (north to at least 69° 14.24' N) and the Darwin Mounds off western Scotland. Deep-water coral bioherms are quite common off the southeastern United States. The term coral reef does not refer only the physical structure; it is an ecosystem. An ecosystem consists both of the abiotic environment as well as the biotic community (an assemblage of plant, animal, and other living organisms). Coral reefs form some of the most diverse ecosystems on Earth, and have been called "rainforests of the sea." They occupy less than one tenth of one percent of the world ocean surface, about half the area of France, yet they provide a home for twenty-five percent of all marine species, including fish, mollusks, worms, crustaceans, echinoderms, sponges, tunicates and other cnidarians. Coral reefs are fragile ecosystems, partly because they are very sensitive to water temperature. They are under threat from climate change, ocean acidification, blast fishing, cyanide fishing for aquarium fish, overuse of reef resources, and harmful land-use practices, including urban and agricultural runoff and water pollution, which can harm reefs by encouraging excess algae growth. Anatomy of a coral polyp. Live coral are small marine invertebrates (phylum Cnidaria, class Anthozoa) embedded in calcium carbonate shells. 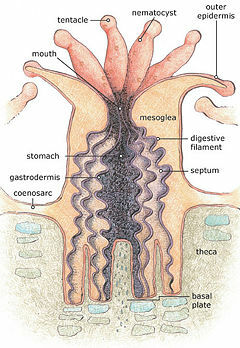 As members of the Anthozoa class ("flower animals,"), they live only as the vase-shaped polyps, characterized by a tubular body with tentacles around the mouth, and they are mostly sedentary after the larval stage. Corals typically live in colonies of many individuals and commonly attached to a hard surface, giving the appearance of plants or rocks. Polyps are usually tiny, but they can range in size from a pinhead to a foot across. These accumulations of polyps can be arranged in a wide diversity of shapes. For example, branching corals have branches and these branches have further branches; table corals create table-like structures with the branches fused; and digitate corals give the appearance of fingers. Other colony structures include elkhorn corals or staghorn corals, which have flattened and large branches; massive corals, which are shaped like balls or boulders and can be the size of eggs or houses; submassive corals or pillar corals, which look like columns or wedges protruding from a base; mushroom corals that resemble the tops of mushrooms; and cup corals, which look like eggs cups or like cups that have been elongated, twisted, or squashed. Reef-building or hermatypic corals live only in the euphotic zone, the depth to which sufficient sunlight penetrates the water for photosynthesis to occur. Coral polyps do not themselves photosynthesize, but have a symbiotic relationship with single-celled organisms called zooxanthellae; these organisms live within the tissues of polyps and provide organic nutrients that nourish the polyp. Because of this relationship, coral reefs grow much faster in clear water, which admits more sunlight. Indeed, the relationship is responsible for coral reefs in the sense that without their symbionts, coral growth would be too slow for the corals to form significant reef structures. Corals get up to 90% of their nutrients from their zooxanthellae symbionts. Reefs grow as the coral polyps and other organisms deposit calcium carbonate, the basis of coral, as a skeletal structure beneath and around themselves, pushing the coral head's top upwards and outwards. Many other organisms living in the reef community contribute skeletal calcium carbonate in the same manner. Coralline algae are important contributors to reef structure in those parts of the reef subjected to the greatest forces by waves (such as the reef front facing the open ocean). These algae deposit limestone in sheets over the reef surface, thereby strengthening it. Waves, grazing fish (such as parrotfish), sea urchins, sponges, and other forces and organisms act as bioeroders, breaking down coral skeletons into fragments that settle into spaces in the reef structure or form sandy bottoms in associated reef lagoons. Fringing reef: The most common type, a fringing reef is one that is directly attached to a shore or borders it with an intervening shallow channel or lagoon. Many fringing reefs can be found in the Florida Keys. Barrier reef: A barrier reef also borders the shoreline, but it is separated from a mainland or island shore by a deep channel or lagoon; that is, it is separated by a greater distance from the shoreline (a mile or more) and there is open, often deep water separating it from the adjacent land mass. The Great Barrier Reef around Australia is the world's largest barrier reef. Atoll reef: An atoll reef is a more or less continuous circular or oval barrier reef extending all the way around a lagoon without a central island. In other words, if a fringing reef or barrier reef were to form around a volcanic island, and then the island were to sink entirely below the sea level, while the atoll continues to expand upward, an atoll would be formed. Passages may exist between the central lagoon and the ocean. An example is the Bikini Atoll. A small atoll in the Maldives. Patch reef – an isolated, comparatively small reef outcrop, usually within a lagoon or embayment, often circular and surrounded by sand or seagrass. Patch reefs, which are basically small patches of reef, are common. 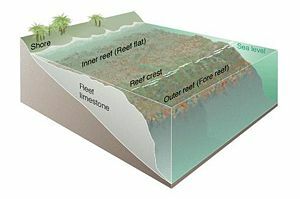 Bank reef or platform reef – isolated reefs with a linear or semi-circular shaped-outline and flat top, larger than a patch reef. Table reef – an isolated reef, approaching an atoll type, but without a lagoon. Microatolls – certain species of corals form communities called microatolls. The vertical growth of microatolls is limited by average tidal height. By analyzing growth morphologies, microatolls offer a low resolution record of patterns of sea level change. Fossilized microatolls can also be dated using radioactive carbon dating. Such methods have been used to reconstruct Holocene sea levels. Cays – small, low-elevation, sandy islands formed on the surface of a coral reef. Material eroded from the reef piles up on parts of the reef or lagoon, forming an area above sea level. Plants can stabilize cays enough to become habitable by humans. Cays occur in tropical environments throughout the Pacific, Atlantic, and Indian Oceans (including the Caribbean and on the Great Barrier Reef and Belize Barrier Reef), where they provide habitable and agricultural land for hundreds of thousands of people. When a coral reef cannot keep up with the sinking of a volcanic island, a seamount or guyot is formed. The tops of seamounts and guyots are below the surface. Seamounts are rounded at the top and guyots are flat. The flat top of the guyot, also called a tablemount, is due to erosion by waves, winds, and atmospheric processes. Most existing coral reefs were formed after the last glacial period when melting ice caused the sea level to rise and flood the continental shelves. This means that most coral reefs are less than 10,000 years old. As coral reef communities were established on the shelves, they built reefs that grew upwards, keeping pace with the rise in sea level. Reefs that did not keep pace could become drowned reefs, covered by so much water that there was insufficient light for further survival.Cite error: Closing </ref> missing for <ref> tag Charles Darwin set out his theory of the formation of atoll reefs, an idea he conceived during the voyage of the Beagle. His theory was that atolls were formed by the uplift and subsidence of the Earth's crust under the oceans. Darwin’s theory sets out a sequence of three stages in atoll formation. It starts with a fringing reef forming around an extinct volcanic island as the island and ocean floor subsides. As the subsidence continues, the fringing reef becomes a barrier reef, and ultimately an atoll reef. Darwin predicted that underneath each lagoon would be a bed rock base, the remains of the original volcano. Subsequent drilling proved this correct. Darwin's theory followed from his understanding that coral polyps thrive in the clean seas of the tropics where the water is agitated, but can only live within a limited depth of water, starting just below low tide. Where the level of the underlying land stays the same, the corals grow around the coast to form what he called fringing reefs, and can eventually grow out from the shore to become a barrier reef. Where the land is rising, fringing reefs can grow around the coast, but coral raised above sea level dies and becomes white limestone. If the land subsides slowly, the fringing reefs keep pace by growing upwards on a base of dead coral, forming a barrier reef enclosing a lagoon between the reef and the land. A barrier reef can encircle an island, and once the island sinks below sea level a roughly circular atoll of growing coral continues to keep up with the sea level, forming a central lagoon. Barrier reefs and atolls do not usually form complete circles, but are broken in places by storms. Should the land subside too quickly or sea level rise too fast, the coral dies as it is below its habitable depth. In general, the two main variables determining the geomorphology, or shape, of coral reefs are the nature of the underlying substrate on which they rest, and the history of the change in sea level relative to that substrate. As an example of how coral reefs have formed on continental shelves, the current living reef structure of the Great Barrier Reef began growing about 20,000 years ago. Sea level was then 120 meters (around 400 feet) lower than it is today. As sea levels rose, the water and the corals encroached on what had been hills of the Australian coastal plain. By 13,000 years ago, the sea level had risen to 60 meters (around 200 feet) lower than at present, and the hills of the coastal plains were, by then, continental islands. As the sea level rise continued, water topped most of the continental islands. The corals could then overgrow the hills, forming the present cays and reefs. Sea level on the Great Barrier Reef has not changed significantly in the last 6,000 years, and the age of the present living reef structure is estimated to be between 6,000 and 8,000 years. Although the Great Barrier Reef formed along a continental shelf, and not around a volcanic island, Darwin's principles apply. The Great Barrier Reef development stopped at the barrier reef stage, since Australia is not about to submerge. It formed the world's largest barrier reef, 300-1000 meters (1000-3300 feet) from shore, stretching for 2000 kilometers (1200 miles). Healthy coral reefs grow horizontally from 1 to 3 centimeters (0.4 - 1.2 inches) per year, and grow vertically anywhere from 1 to 25 centimeters (0.4 - 10 inches) per year; however, they grow only at depths shallow enough to permit ample sunlight, and cannot grow above sea level. Beginning a few thousand years after hard skeletons were developed by marine organisms, coral reefs emerged. The times of maximum development were in the Middle Cambrian (513–501 Ma), Devonian (416–359 Ma), and Carboniferous (359–299 Ma), due to Order Rugosa extinct corals, and Late Cretaceous (100–65 Ma) and all Neogene (23 Ma–present), due to Order Scleractinia corals. Not all reefs in the past were formed by corals: Early Cambrian (542–513 Ma) reefs resulted from calcareous algae and archaeocyathids (small animals with conical shape, probably related to sponges), while rudists (a type of bivalve) built Late Cretaceous (100–65 Ma) reefs. Coral reef ecosystems contain distinct zones that represent different kinds of habitats. Usually three major zones are recognized: the fore reef, reef crest, and the back reef (frequently referred to as the reef lagoon). All three zones are physically and ecologically interconnected. Reef life and oceanic processes create opportunities for exchange of seawater, sediments, nutrients, and marine life among one another. Thus, they are integrated components of the coral reef ecosystem, each playing a role in the support of the reefs' abundant and diverse fish assemblages. Most coral reefs exist in shallow waters less than fifty meters deep. Some inhabit tropical continental shelves where cool, nutrient rich upwelling does not occur, such as Great Barrier Reef. Others are found in the deep ocean surrounding islands or as atolls, such as in the Maldives. The reefs surrounding islands form when islands subside into the ocean, and atolls form when an island subsides below the surface of the sea. Alternatively, Moyle and Cech distinguish six zones, though most reefs possess only some of the zones. Water in the reef surface zone is often agitated. This diagram represents a reef on a continental shelf. The water waves at the left travel over the off-reef floor until they encounter the reef slope or fore reef. Then the waves pass over the shallow reef crest. When a wave enters shallow water it shoals, that is, it slows down and the wave height increases. The reef surface is the shallowest part of the reef. It is subject to the surge and the rise and fall of tides. When waves pass over shallow areas, they shoal, as shown in the diagram at the right. This means that the water is often agitated. These are the precise condition under which coral flourish. Shallowness means there is plenty of light for photosynthesis by the symbiotic zooxanthellae, and agitated water promotes the ability of coral to feed on plankton. However other organisms must be able to withstand the robust conditions to flourish in this zone. The off-reef floor is the shallow sea floor surrounding a reef. 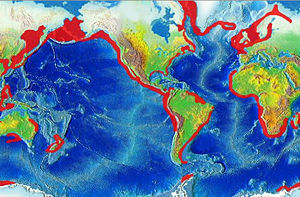 This zone occurs by reefs on continental shelves. Reefs around tropical islands and atolls drop abruptly to great depths, and do not have a floor. Usually sandy, the floor often supports seagrass meadows which are important foraging areas for reef fish. The reef drop-off is, for its first 50 meters, habitat for many reef fish who find shelter on the cliff face and plankton in the water nearby. The drop-off zone applies mainly to the reefs surrounding oceanic islands and atolls. The reef face is the zone above the reef floor or the reef drop-off. "It is usually the richest habitat. Its complex growths of coral and calcareous algae provide cracks and crevices for protection, and the abundant invertebrates and epiphytic algae provide an ample source of food." The reef flat is a sandy bottomed flat area that can be behind the main reef, containing chunks of coral. "The reef flat may be a protective area bordering a lagoon, or it may be a flat, rocky area between the reef and the shore. In the former case, the number of fish species living in the area often is the highest of any reef zone." The reef lagoon is the structure when a coral reef completely encloses an area, thereby creating a quiet-water lagoon that usually contains small patches of reef." However, the "topography of coral reefs is constantly changing. Each reef is made up of irregular patches of algae, sessile invertebrates, and bare rock and sand. The size, shape and relative abundance of these patches changes from year to year in response to the various factors that favor one type of patch over another. Growing coral, for example, produces constant change in the fine structure of reefs. On a larger scale, tropical storms may knock out large sections of reef and cause boulders on sandy areas to move." Coral reefs are estimated to cover 284,300 square kilometers (109,800 square miles), which is just under one tenth of one percent of the oceans' surface area. The Indo-Pacific region (including the Red Sea, Indian Ocean, Southeast Asia, and the Pacific) account for 91.9% of this total. Southeast Asia accounts for 32.3% of that figure, while the Pacific including Australia accounts for 40.8%. Atlantic and Caribbean coral reefs account for 7.6%. Boundary for 20 °C isotherms. Most corals live within this boundary. Note the cooler waters caused by upwelling on the south west coast of Africa and off the coast of Peru. Although corals exist both in temperate and tropical waters, shallow-water reefs form only in a zone extending from 30° N to 30° S of the equator. Tropical corals do not grow at depths of over 50 meters (about 160 feet). The optimum temperature for most coral reefs is 26-27°C, and few reefs exist in waters below 18°C (64°F). However. reefs in the Persian Gulf have adapted to temperatures of 13°C in winter and 38°C in summer. Deep water coral can exist at greater depths and colder temperatures. Although deep water corals can form reefs, very little is known about them. Coral reefs are rare along the American west coast, as well as along the African west coast. This is due primarily to upwelling and strong cold coastal currents that reduce water temperatures in these areas (respectively the Peru, Benguela and Canary streams). Corals are seldom found along the coastline of South Asia from the eastern tip of India (Madras) to the border of Bangladesh and Myanmar. They are also rare along the coast around north-eastern South America and Bangladesh due to the freshwater release from the Amazon and Ganges Rivers respectively. The Red Sea - includes 6000-year-old fringing reefs located around a 2000-kilometer (1240-mile) coastline. Ghe Raja Ampat Islands in Indonesia's West Papua province offers the highest known marine diversity. Darwin's paradox Coral... seems to proliferate when ocean waters are warm, poor, clear and agitated, a fact which Darwin had already noted when he passed through Tahiti in 1842. This constitutes a fundamental paradox, shown quantitatively by the apparent impossibility of balancing input and output of the nutritive elements which control the coral polyp metabolism. 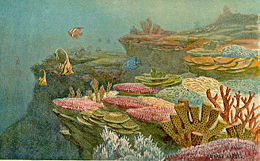 During his voyage on the Beagle, Darwin described tropical coral reefs as oases in the desert of the ocean. He reflected on the paradox that tropical coral reefs, which are among the richest and most diverse ecosystems on earth, flourish surrounded by tropical ocean waters that provide hardly any nutrients. Coral reefs cover less than one tenth of one percent of the surface of the world’s ocean, yet they support over one-quarter of all marine species. This huge number of species results in complex food webs, with large predator fish eating smaller forage fish that eat yet smaller zooplankton and so on. However, all food webs eventually depend on plants, which are the primary producers. Coral reefs' primary productivity is very high, typically producting 5-10g C m−2 day−1 biomass. One reason for the startling clarity of tropical waters is that they are deficient in nutrients and drifting plankton. Further, the sun shines year round in the tropics, warming the surface layer, making it less dense than subsurface layers. The warmer water is separated from the cooler water by a stable thermocline, where the temperature makes a rapid change. This keeps the warm surface waters floating above the cooler deeper waters. In most parts of the ocean, there is little exchange between these layers. Organisms that die in aquatic environments generally sink to the bottom where they decompose. This decomposition releases nutrients in the form of nitrogen (N), phosphorus, (P) and potassium (K). These nutrients are necessary for plant growth, but in the tropics they are not directly recycled back to the surface. Plants form the base of the food chain, and need sunlight and nutrients to grow. In the ocean, these plants are mainly microscopic phytoplankton, which drift in the water column. They need sunlight for photosynthesis, which powers carbon fixation, so they are found only relatively near the surface. But they also need nutrients. Phytoplankton rapidly use nutrients in the surface waters, and in the tropics these nutrients are not usually replaced because of the thermocline. Around coral reefs, lagoons fill in with material eroded from the reef and the island. They become havens for marine life, providing protection from waves and storms. Most importantly, reefs recycle nutrients, which happens much less in the open ocean. In coral reefs and lagoons, producers include phytoplankton as well as seaweed and coralline algae, especially small types called turf algae, which pass nutrients to corals. The phytoplankton are eaten by fish and crustaceans, who also pass nutrients along the food web. Recycling ensures that fewer nutrients are needed overall to support the community. Coral reefs support many symbiotic relationships. In particular, zooxanthellae provides energy to coral in the form of glucose, glycerol, and amino acids. Zooxanthellae can provide up to 90% of a coral’s energy requirements. In return, as an example of mutualism, the coral shelter the zooxanthellae, averaging one million for every cubic centimeter of coral, and provide a constant supply of the carbon dioxide it needs for photosynthesis. Corals also absorb nutrients, including inorganic nitrogen and phosphorus, directly from the water. Many corals extend their tentacles at night to catch zooplankton that brush them when the water is agitated. Zooplankton provide the polyp with nitrogen, and the polyp shares some of the nitrogen with the zooxanthellae, which also require this element. The varying pigments in different species of zooxanthellae give corals their different colors. Coral which loses its zooxanthellae becomes white and is said to be bleached, a condition that, unless corrected, can kill the coral. Sponges are another key to explaining Darwin’s paradox. They live in crevices in the coral reefs. They are efficient filter feeders, and in the Red Sea they consume about sixty percent of the phytoplankton that drifts by. The sponges eventually excrete nutrients in a form the corals can use. The roughness of coral surfaces is the key to coral survival in agitated waters. Normally, a boundary layer of still water surrounds a submerged object, which acts as a barrier. Waves breaking on the extremely rough edges of corals disrupt the boundary layer, allowing the corals access to nutrients. Turbulent water thereby promotes rapid reef growth and lots of branching. Without the nutritional gains brought by rough coral surfaces, even the most effective recycling would leave corals wanting in nutrients. Cyanobacteria provide soluble nitrates for the reef via nitrogen fixation. Coral reefs also often depend on surrounding habitats, such as seagrass meadows and mangrove forests, for nutrients. Seagrass and mangroves supply dead plants and animals that are rich in nitrogen and also serve to feed fish and animals from the reef by supplying wood and vegetation. Reefs in turn protect mangroves and seagrass from waves and produce sediment for the mangroves and seagrass to root in. Reefs are home to a large variety of organisms, including fish, seabirds, sponges, Cnidarians (which includes some types of corals and jellyfish), worms, crustaceans (including shrimp, cleaner shrimp, spiny lobsters, and crabs), mollusks (including cephalopods), echinoderms (including starfish, sea urchins, and sea cucumbers), sea squirts, sea turtles, and sea snakes. Aside from humans, mammals are rare on coral reefs, with visiting cetaceans such as dolphins being the main exception. A few of these varied species feed directly on corals, while others graze on algae on the reef. Fish that influence the coral (such as Labridae and parrotfish) These types of fish feed either on small animals living near the coral, seaweed, or on the coral itself. Fish that feed on small animals include cleaner fish (these fish feed on organisms that inhabit larger fish), bullet fish, and Balistidae (these eat sea urchins), while seaweed-eating fish include the Pomacentridae (damselfishes). Serranidae cultivate the seaweed by removing creatures feeding on it (such as sea urchins), and they remove inedible seaweeds. Fish that eat coral itself include parrotfish and butterflyfish. Fish that cruise the boundaries of the reef or nearby seagrass meadows. These include predatory fish such as pompanos, groupers, Horse mackerels, certain types of shark, Epinephelus marginatus, barracudas, and snappers). Herbivorous and plankton-eating fish also populate reefs. Seagrass-eating fish include Horse mackerel, snapper, Pagellus, and Conodon. Plankton-eating fish include Caesio, manta ray, chromis, Holocentridae, and pterapogon kauderni. Organisms can cover every square inch of a coral reef. Fish that swim in coral reefs can be as colorful as the reef. Examples are the parrotfish, angelfish, damselfish, Pomacanthus paru, Clinidae, and butterflyfish. At night, some change to a less vivid color. Besides colorful fish matching their environment, other fish (e.g., predatory and herbivorous fish such as Lampanyctodes hectoris, Holocentridae, and Pterapogon kauderni) as well as aquatic animals (Comatulida, Crinoidea, and Ophiuroidea) emerge and become active while others rest. Other fish groups found on coral reefs include groupers, grunts, and wrasses. Over 4,000 species of fish inhabit coral reefs. Healthy reefs can produce up to 35 tons of fish per square kilometer each year, but damaged reefs produce much less. Sea urchins, Dotidae and sea slugs eat seaweed. Some species of sea urchins, such as Diadema antillarum, can play a pivotal part in preventing algae overrunning reefs. Nudibranchia and sea anemones eat sponges. A number of invertebrates, collectively called cryptofauna, inhabit the coral skeletal substrate itself, either boring into the skeletons (through the process of bioerosion) or living in pre-existing voids and crevices. Those animals boring into the rock include sponges, bivalve mollusks, and sipunculans. Those settling on the reef include many other species, particularly crustaceans and polychaete worms. Researchers have found evidence of algae dominance in locations of healthy coral reefs. In surveys done around largely uninhabited US Pacific islands, algae inhabit a large percentage of surveyed coral locations. The algae population consists of turf algae, coralline algae, and macroalgae. Coral reef systems provide important habitats for seabird species, some endangered. For example, Midway Atoll in Hawaii supports nearly three million seabirds, including two-thirds (1.5 million) of the global population of Laysan Albatross, and one-third of the global population of black-footed albatross. Each seabird species has specific sites on the atoll where they nest. Altogether, 17 species of seabirds live on Midway. The short-tailed albatross is the rarest, with fewer than 2,200 surviving after excessive feather hunting in the late nineteenth century. Sea snakes feed exclusively on fish and their eggs. Tropical birds such as herons, gannets, pelicans, and boobies feed on reef fish. Some land based reptiles intermittently associate with reefs, such as monitor lizards, the marine crocodile, and semi-aquatic snakes like Laticauda colubrina. Coral reefs deliver ecosystem services to tourism, fisheries, and coastline protection. The global economic value of coral reefs has been estimated at as much as $US375 billion per year. Coral reefs protect shorelines by absorbing wave energy, and many small islands would not exist without their reef to protect them. Coral reefs protected about 150,000 kilometersof shorelines in more than 100 countries, defending the coastal communities against erosion and storms, with more than 275 million people living in the direct vicinity of coral reefs. According to the World Wide Fund for Nature (WWF), the economic cost over a 25 year period of destroying one kilometer of coral reef is somewhere between $137,000 and $1,200,000. About 6 million tons of fish are taken each year from coral reefs. Well-managed coral reefs have an annual yield of 15 tons seafood on average per square kilometer. Southeast Asia's coral reef fisheries alone yield about $ 2.4 billion annually from seafood. Island with fringing reef off Yap, Micronesia. Coral reefs are dying around the world. Coral reefs are dying around the world, threatened by a diversity of human activities. In particular, coral mining, coastal development, agricultural and urban runoff, pollution (organic and non-organic), overfishing, blast fishing, disease, and the digging of canals and access into islands and bays are localized threats to coral ecosystems. Broader threats are sea temperature rise, sea level rise, and pH changes from ocean acidification. In El Nino-year 2010, preliminary reports show global coral bleaching reached its worst level since another El Nino year, 1998, when 16 percent of the world's reefs died as a result of excessive water temperature. In Indonesia's Aceh province, surveys showed some 80 percent of bleached corals died. In July, Malaysia closed several dive sites after virtually all the corals in some areas were damaged by bleaching. General estimates show approximately 10% world's coral reefs are already dead. According to an assessment released in 2011 by a network of more than 25 organizations, including Nature Conservancy, the Global Coral Reef Monitoring Network, and UNEP-WCMC, an estimated 75% of the coral reefs of the world are threatened by anthropogenic impacts, and more than 90% will be threatened by 2030 if these threats are not dealt with in a timely fashion. Efforts to expand the size and number of coral reefs generally involve supplying substrate to allow more corals to find a home. Substrate materials include discarded vehicle tires, scuttled ships, subway cars, and formed concrete such as reef balls. Reefs also grow unaided on marine structures such as oil rigs. In large restoration projects, propagated hermatypic coral on substrate can be secured with metal pins, superglue, or milliput. Needle and thread can also attach A-hermatype coral to substrate. Low voltage electrical currents applied through seawater crystallize dissolved minerals onto steel structures. The resultant white carbonate (aragonite) is the same mineral that makes up natural coral reefs. Corals rapidly colonize and grow at accelerated rates on these coated structures. The electrical currents also accelerate formation and growth of both chemical limestone rock and the skeletons of corals and other shell-bearing organisms. The vicinity of the anode and cathode provides a high pH environment, which inhibits the growth of competitive filamentous and fleshy algae. The increased growth rates fully depend on the accretion activity. During accretion, the settled corals display an increased growth rate, size, and density, but after the process is complete, growth rate and density return to levels that are comparable to naturally growing corallites, and are about the same size or slightly smaller. ↑ 1.0 1.1 1.2 1.3 Coris, "What are coral reefs?" National Oceanic and Atmospheric Administration (NOAA) Coral Reef Information System (2010). Retrieved March 6, 2011. ↑ A. D. Rogers, "The biology of Lophelia pertusa (Linnaeus 1758) and other deep-water reef-forming corals and impacts from human activities," Internat. Rev. Hydrobiol 84(1999): 315-406. ↑ T. A. Link, "Theory of transgressive and regressive reef (bioherm) development and origin of oil," Bulletin of the American Association of Petroleum Geologists 34(1950): 263-297. Retrieved March 5, 2011. ↑ J. Kleypas, "Coral reef," The Encyclopedia of Earth (2010). Retrieved March 5, 2011. ↑ M. Mulhall, "Saving rainforests of the sea: An analysis of international efforts to conserve coral reefs," Duke Environmental Law and Policy Forum 19(2007):321–351. Retrieved March 6, 2011. ↑ J. Hoover, Hawaiʻi's Sea Creatures (Mutual, 2007). ISBN 15854702902. 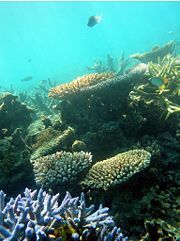 ↑ ARC Centre of Excellence for Coral Reef Studies, [http://www.coralcoe.org.au/news_stories/landimpacts.html "Corals reveal impact of land use," ARC Centre of Excellence for Coral Reef Studies (2007). Retrieved March 6, 2011. ↑ C. Minato, "Urban runoff and coastal water quality being researched for effects on coral reefs," Hawaii Coral Reef Initiative Research Program (2002). Retrieved March 6, 2011. ↑ United States Environmental Protection Agency, "Coastal watershed factsheets: Coral reefs and your coastal watershed," EPA (1998). Retrieved March 6, 2011. ↑ 10.0 10.1 P. Marshall, and H. Schuttenberg, A Reef Manager’s Guide to Coral Bleaching (Townsville, Australia: Great Barrier Reef Marine Park Authority, 2006). ISBN 1876945400. Retrieved March 7, 2011. ↑ J. Stacy, G. Marion, M. McCulloch, and O. Hoegh-Guldberg, "Long-term changes to Mackay Whitsunday water quality and connectivity between terrestrial, mangrove and coral reef ecosystems: Clues from coral proxies and remote sensing records," University of Queensland, Centre for Marine Studies (May 2007). Retrieved March 6, 2011. ↑ S. G. Smithers, and C. D. Woodroffe, "Microatolls as sea-level indicators on a mid-ocean atoll," Marine Geology 168(2000): 61-78. Retrieved March 7, 2011. ↑ 13.0 13.1 G. Chancellor, "Introduction to coral reefs," Darwin Online (2008). Retrieved March 7, 2011. ↑ NOAA Ocean Service Education, "Animation of coral atoll formation," NOAA (March 25, 2008). Retrieved March 7, 2011. ↑ 15.0 15.1 15.2 G. Anderson, Coral "Reef formation," Marine Science (2003). Retrieved March 8, 2011. ↑ Great Barrier Reef Marine Park Authority, "A "big picture" view of the Great Barrier Reef," Reef Facts for Tour Guides (2006). Retrieved March 7, 2011. ↑ 17.0 17.1 B. Tobin, "How the Great Barrier Reef was formed: 20,000 years ago to present," Australian Institute of Marine Science (2010). Retrieved March 7, 2011. ↑ CRC Reef Research Centre, "What is the Great Barrier Reef?" CRC Reef Research Centre (n.d.). Retrieved March 7, 2011. ↑ Microdocs, "Four types of coral reef," Standford University (2010). Retrieved March 7, 2011. ↑ 20.0 20.1 20.2 20.3 P. B. Moyle, and J. J. Cech, Fishes, An Introduction to Ichthyology, 5th ed. (Benjamin Cummings, 2003). ISBN 9780131008472. ↑ J. H. Connell, "Diversity in tropical rain forests and coral reefs," Science 199(1978), issue 4335: 1302–1310. ↑ 22.0 22.1 22.2 22.3 22.4 M. Spalding, C. Ravilious, and E. Green, World Atlas of Coral Reefs (Berkeley, CA: University of California Press and UNEP/WCMC, 2001). ISBN 0520232550. ↑ Y. Achituv, and Z. Dubinsky, "Evolution and zoogeography of coral reefs," in Volume 25, pages 1-8 of Z. Dubinsky and D. W. Goodall, Ecosystems of the World: Coral Reefs (Amsterdam: Elsevier, 1990). ISBN 0444873929. ↑ 24.0 24.1 S. Wells, and N. Hanna, ""The Greenpeace Book of Coral Reefs (New York: Sterling Pub. Co., 1992). ISBN 0806987952. ↑ 25.0 25.1 J. Nybakken, Marine Biology: An Ecological Approach, 4th ed. (Menlo Park, CA: Addison Wesley, 1997). ISBN 0673994511. ↑ D. Doubilet, "Ultra Marine: In far eastern Indonesia, the Raja Ampat islands embrace a phenomenal coral wilderness," National Geographic September 2007. Retrieved March 8, 2011. ↑ F. Rougerier, "The functioning of coral reefs and atolls: From paradox to paradigm," Pages 163-171 in C. Jost (ed. ), The French-Speaking Pacific: Population, Environment and Development Issues (Brisbane: Boombana Publications, 1998). ISBN 1876542020. Retrieved March 8, 2011. ↑ Y. I. Sorokin, Coral Reef Ecology (Berlin: Springer-Herlag, 1993). ISBN 0387564276. ↑ 29.0 29.1 29.2 P. Castro, and M. Huber, Marine Biology, 3rd ed. (Boston: McGraw-Hill, 2000). ISBN 0070121974. ↑ NOAA Ocean Service Education, "Zooxanthellae… What's that?" NOAA (March 25, 2008). Retrieved March 8, 2011. ↑ J. Roach, "Rich coral reefs in nutrient-poor water: Paradox explained?" National Geographic News, November 7, 2001. Retrieved March 8, 2011. ↑ R. Nowak, "Corals play rough over Darwin's paradox," New Scientist September 21, 2002. Retrieved March 8, 2011. ↑ E. Wilson, "Coral’s symbiotic bacteria fluoresce, fix nitrogen," Chemical and Engineering News 82(2004), No. 33: 7. Retrieved March 8, 2011. ↑ K. McClellan, and J. Bruno, "Coral degradation through destructive fishing practices," The Encyclopedia of Earth (2010). Retrieved March 8, 2011. ↑ P. L. Osborne, Tropical Ecosystem and Ecological Concepts (Cambridge: Cambridge University Press, 2000). ISBN 0521645239. ↑ P. S. Vroom, K. N. Page, J. C. Kenyon, and R. E. Brainard, "Algae-Dominated Reefs," American Scientist 94(2006)iss. 5: 430–437..
↑ Honolulu Advertiser staff, "Midway's albatross population stable," Honolulu Advertiser January 17, 2005. Retrieved March 8, 2011. ↑ U.S. Fish and Wildlife Service, "Birds of Midway Atoll, U.S. Fish and Wildlife Service (2011). Retrieved March 8, 2011. ↑ National Oceanic and Atmospheric Administration (NOAA),"Heat stress to Caribbean corals in 2005 worst on record," NOAA (2010). Retrieved March 8, 2011. ↑ 40.0 40.1 40.2 40.3 40.4 United Nations News Centre, "UN-backed report shows most of world's coral reefs under threat," UN News Centre February 24, 2011. Retrieved March 8, 2011. 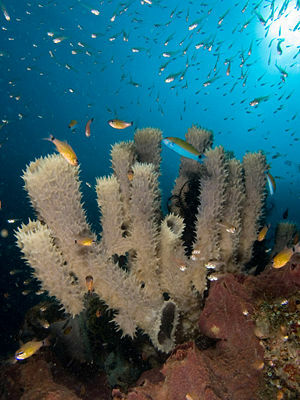 ↑ 41.0 41.1 World Wide Fund for Nature (WWF), "The importance of coral to people," WWF (2011). Retrieved March 8, 2011. ↑ 42.0 42.1 Guardian, "Coral reefs around the world," Guardian.co.uk September 2, 2009. ↑ K. Ritter, "Climate goal may spell end for some coral reefs," Associated Press December 7, 2010. Retrieved March 8, 2011. ↑ S. Markey, "Global warming has devastating effect on coral reefs, study shows," National Geographic News May 16, 2006. Retrieved March 8, 2011. ↑ J. A. Kleypas, R. A. Feely, V. J. Fabry, C. Langdon, C. L. Sabine, and L. L. Robbins, "Impacts of ocean acidification on coral reefs and other marine calcifiers: A guide for future research," NSF, NOAA, & USGS (2006). ↑ K. Tun, L. M. Chou, A. Cabanban, V. S. Tuan, T. Philreefs, S. Yeemin, K. S. Suharsono, and D. Lane, Pages 235-276 in C. Wilkinson (ed. ), Status of Coral Reefs of the World (Queensland: Australian Institute of Marine Science, 2004). ↑ Earth Observatory, [http://earthobservatory.nasa.gov/Newsroom/NewImages/images.php3?img_id=17182 "Coral reef management, Papua New Guinea," NASA's Earth Observatory February 12, 2006. Retrieved March 8, 2011. ↑ 48.0 48.1 M. G. Sabater, and H. T. Yap, "Long-term effects of induced mineral accretion on growth, survival, and corallite properties of Porites cylindrica Dana," Journal of Experimental Marine Biology and Ecology 311(2004):355-374. Clifton, J. 2003. Prospects for co-management in Indonesia's marine protected areas. Marine Policy 27(5): 389-395. Courtney, C. and A. White. 2000. Integrated Coastal Management in the Philippines. Coastal Management 28: 39-53. Fox, H. E., P. J. Mous, J. S. Pet, A. H. Muljadi, and R. L. Caldwell. 2005. Experimental Assessment of Coral Reef Rehabilitation Following Blast Fishing. Conservation Biology 19: 98-107. Moyle, P. B., and J. J. Cech. 2003. Fishes, An Introduction to Ichthyology, 5th ed. Benjamin Cummings. ISBN 9780131008472. This page was last modified on 4 July 2013, at 19:10.